I had the pleasure of enjoying a seven course tasting at Alan Wong's Restaurant on my vacation....I promise I will mention the more off the beaten path places but I thought this a good place to start. Wong is one of if not the best chef of Hawaii's regional cuisine. He opts to us e regional ingredients and merge them together with a modern take. Restaurant service was amazing and the place was small with a clear view into the kitchen which was interesting for a fine dining restaurant but very fitting to create a cozy ambiance. I chose the seven course tasting menu....to start I had Ahi tartare with coconut ceviche. The ahi and the citrus in the sauce made it absolutely delightful. The small dab of coconut cream and caviar on top took it to another level. Second course was a soup and sandwich....chilled vine ripened tomato soup with grilled mozzarella cheese and a foie gras and kalua pig sandwich. The soup and mozzarella were a perfect combination. I couldn't quite taste the foie gras in the sandwich but the pork was tender with a hint of sweetness. In the picture is what came on my friends plate which was seared ahi inside some fried strings and avocado. For my third course, I had seared Hudson Valley Foie Gras with Ling Ming Hui Chutney. The foie was cooked absolutely perfect and the chutney added a slight sweetness to the dish. There was shrimp and pork mixed in as a delightful twist. I almost didnt want this one to end but there was still more to come. The fourth course was steamed Opakapaka(Hawaiian red snapper) The fish melted in my mouth but here the sau ce was an absolute star. Tasted more of an asian influence in this dish as the sauce was spicy like a curry with hints of coconut. Left my mouth stinging but was very very tasty. Next up was the way I want the rest of my life to be......butter poached. Butter poached Kona Lobster with spicy corn and lobster broth spiked with Okol ehao(Hawaiian spirit from Ti plant). I've had lobster several places before but never this tender the fork merely touched and it fell apart. Lots of citrus and coconut in the broth ....refreshing and savory all at the same time. Finally the main course Okinauwan sweet potato flan, fried mozzarella, Maui Cattle beef rib eye with bone marrow butter, and beef burger. I started with the flan that had a very slight crisp top and perfectly soft texture. Sweeter than the sweet potatoes I'm used to but still savory. The fried cheese had a surprise in it mixed with what to me tasted li ke potato and butter. It was the only thing that was just okay on the plate. The ribeye was so tender and juicy. It was one of those steaks that you bite into and your salivary glands explode. I was content after I had that. The burger was good too but couldnt hold its own after tasting the steak. For dessert I had Strawberries Romanoff, Hawaii Island Goat Dairy Panna Cotta, Kula Strawberry-Hibiscus Soup, Goat Cheese Sorbet, Hawaiian Vanilla Sabayon. The sorbet with the strawberries were a perfect pair. My friend's dessert was much more playful and fun it was called "The Coconut"- Haupia(Hawaiian for coconut) Sorbet in a Chocolate Shell, Tropical Fruits and Lilikoi Sauce. Lilikoi(passion fruit) appears in lots of places around town. At the swap meet I bought fresh pineapple topped with the pulp or powder of it. Overall Alan Wong's Restaurant provided a wide range of what the island had to offer in a more refined setting. Just made me more more excited for what I might find elsewhere on the island. I remembered Wong appeared in the finale of Top Chef season 2 and after reading about him decided that would be a must on my trip. Well worth it. Mahalo Mr. Wong. 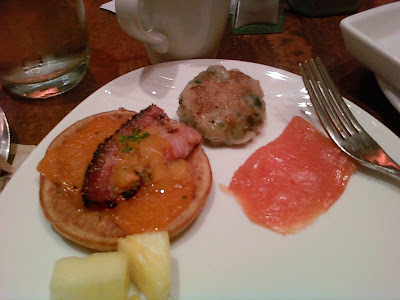 I recently visited Las Vegas and had brunch at the Wynn hotel. I think I tasted everything but one thing stood out more than anything else: the American Pancake. It was a mini sweet (but not too sweet) pancake topped with a slice of cheddar cheese, hickory smoked bacon and peach chutney. If anyone knows how to make this (the pancake part) please let me know. It has been one day since I had it and I've already managed to dream about it three times.